Abu Bakr al Rabeeah is currently a high school student in Edmonton. 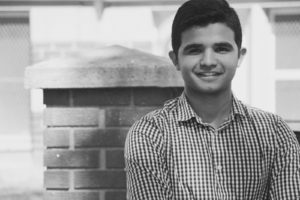 After four years of living in Canada, he enjoys his life here but he also dreams of a future where he can return to help rebuild Iraq and Syria. 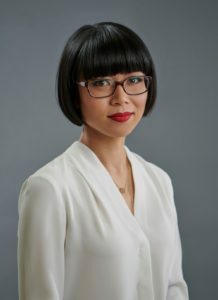 Winnie Yeung has been an English Language Arts teacher for ten years. Homes is her first book. She lives in Edmonton, Canada, with her black pug, Zoe. Homes: A Refugee Story began as an after-school project with Abu Bakr al Rabeeah and his English language arts teacher, Winnie Yeung. It chronicles the struggles of the al Rabeeah family, who left their home in Iraq for Syria in hope of a safer life – just before the Syrian civil war broke out. Abu Bakr, one of eight children, was ten years old when the violence began on the streets around him: car bombings, attacks on his mosque and school, firebombs late at night. Homes tells of the strange juxtaposition of growing up as a typical teenager in a war zone: horrific, unimaginable events punctuated by normalcy – soccer, cousins, video games, friends. 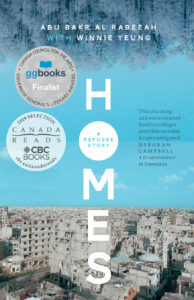 Homes was a 2019 Canada Reads contender (and winner of the audience vote), a finalist for the 2018 Governor General’s Literary Award for Nonfiction, and a finalist for the Shaughnessy Cohen Prize for Political Writing. It was also the April 2019 pick for OverDrive’s Big Library Read, the world’s biggest digital book club.